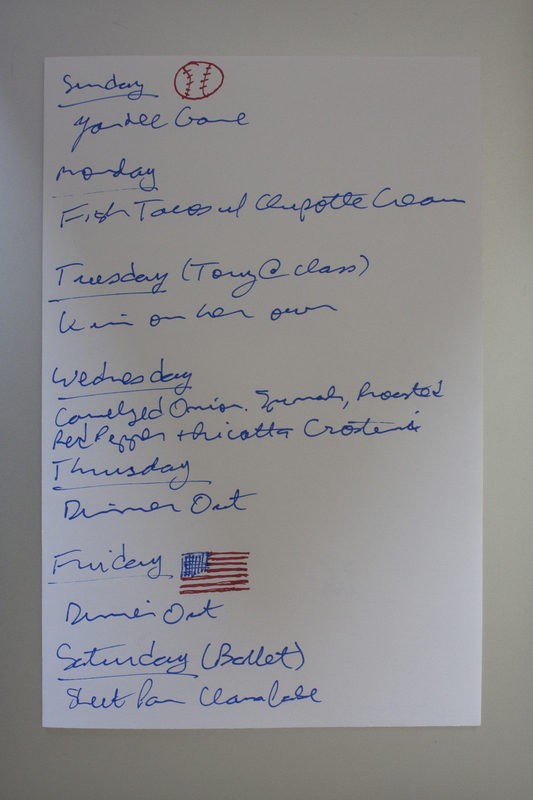 This will be a bit of a busy week, with several dinners out, so we won’t be cooking as much as usual. We’ll try to make up for that by introducing you to a fun breakfast recipe. Sunday is another Yankee game, this one against the Red Sox. With an 8:05 start, that means we’ll definitely be having dinner at the ballpark. So instead of dinner, we’re making breakfast in the form of Glazed Lemon-Ginger Scones. These are very easy to make and, since you don’t have to knead or roll out the dough, require very little space. The recipe makes eight scones, which should be enough to get us through the week. Dinner on Tuesday is an old favorite: Fish Tacos with Chipotle Cream. This is a great summertime dish as it’s very quick, so the stove isn’t on for long, and goes well with both cold beer and chilled wine. Tony bought a six-pack of Shiner Ruby Redbird, which is made by the fine folks who bring us Shiner Bock beer. The beer is flavored with grapefruit and ginger, which should make for an interesting pairing. On Tuesday night, Tony will be taking the second of a two-part photography class, so Kim will be on a her own for dinner. We have some leftovers from lat last week, plus a few things in the freezer, so she should be OK.
Wednesday night will feature Caramelized Onion, Spinach, Roasted Red Pepper and Ricotta Salata Crostini, from Joanne Bruno’s great blog Eats Well With Others. We saw these delicious crostini on Joanne’s Twitter feed last week and thought they sounded like a perfect idea for a light dinner. On Thursday night we will have dinner out to celebrate Kim’s recent promotion. (Yea Kim!) We are going to Hearth, a restaurant we have been wanting to try for a long time. The menu looks fantastic and since Hearth is taking part in the Summer of Riesling, Kim’s favorite wine, she is ecstatic about our plans. Friday is, of course, the Fourth of July. We usually stay home on the Fourth and make something traditional, like burgers or hot dogs, but we decided to leave the city and take a day trip up to Beacon, NY and have dinner there. Kim wants to revisit DIA: Beacon, a fun and funky art museum, while Tony wants to revisit The Hop, a fun and funky beer bar/restaurant. We decided we would make a Fourth-of-July appropriate dinner on the Fifth and are going to try Real Simple’s Sheet-Pan Clambake With Mussels, Shrimp, and Chorizo. We will order as many ingredients as we can from Fresh Direct, but will head out to Whole Foods Saturday morning to buy all the seafood we will need, so that it will be as fresh as possible. Can I eat at your place this week?! 😛 Definitely sounds like a great menu! Let me know how you like the crostini! We’d love to have you! We’ll definitely tell you how we liked the crostini!